2. You have to understand that you when you compress a marketing timeline - you are reducing how well you are able to warm up your leads. Consulting is a relationship business and the things you put into place like high-quality website and content do more than attract a lead. They help you create a connection with a buyer long before you get on the phone. 3. You still need to dial into your ideal client - their demographics (e.g., level, title, company size, industry, etc.) AND their psychographics (e.g., the conversation that is going on in their heads. Your marketing messages and tactics still need to be grounded on how to offer a solution to THEIR wants and needs. This helps discern where to focus your time, money and efforts and keeps you from being busy but not productive. Ultimately - even if you're trying to meet urgent needs - you also still need confidence in your value proposition - because all of your immediate efforts will be focused on finding the people who you can help and who genuinely need you. 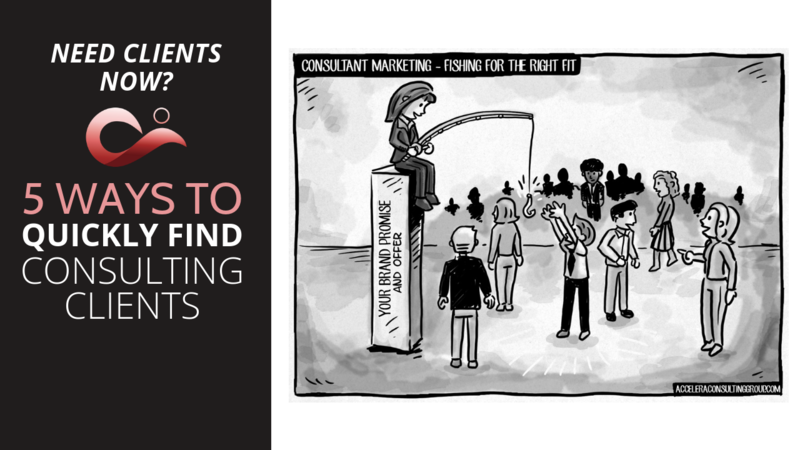 There's lots of ways to promote your consulting services. The best option will be based on your ideal client's preferences as well as your own. When you are at the event, practice using a more conversational and branded response to the question “So, what do you do?” Don’t answer with “I’m a consultant.” Find a way to communicate what you do by explaining the situation that your help is needed, what you do to help and the value it creates. Focus on adding on-the-spot value by asking good questions and focusing more on the people you are meeting vs. establishing your credentials. Engaging an audience of potential buyers is a sure-fire way of generating both awareness and interest in your consulting. Speaking engagements demonstrate your thought leadership, provide a plethora of networking opportunities and are a source for new business. Say “yes” to events where your BUYERS will be at. Dress to CONNECT (not impress) – be approachable. Bring business cards and eBooks/white papers if you have them. Select a topic that hits pain points in the bullseye. Include a ton of value in your presentation plus a lot of reflection questions to help them see their need for someone like you. Don’t sell – include calls to action to get a compelling quick win freebie in exchange for email. Have them send you an email directly so you can engage with them. When they email you – ask them about their business and needs. LinkedIn is a literal goldmine for finding your next clients. According to LinkedIn expert Josh Turner, 76% of executives are on LinkedIn and 40% check in on this platform daily. You can engage with your future clients in groups and in comments on posts. You can demonstrate your credibility with your own content sharing and posting (original and curated.) And the best part, there’s search features that allow you to precisely find your ideal clients and connect with them. Respond to every invitation with the magic question: “Hi [insert name]. Thanks for reaching out to connect with me here. I was wondering, is there something I can help you with or did you just want to stay connected for the future?” If yes, offer free consult. Proactively connect with anyone who comments on your stuff or views your profile. Use the search feature to find your perfect client and ask them to connect. Like, comment and share their stuff. Get into groups and add value. Go through your network and proactively reach out with a free article or other value. “Stalk” your favorite clients and see who is in their network and ask your friends to introduce you to theirs. The thing is with consulting - we don't sell. We offer an invitation for strategic partnership. Marketing's job is done when a client expresses interest in working with us so your big offer at this stage is a free consult, discovery call or exploratory discussion. Use data from assessment and past work to create business case for next phase of work. Document ideas in the document we use for Directional Agreement. Schedule meeting with client to do both a project close out and Directional Agreement for next phase. Offer your document as a “straw person” and starting point. Schedule a meeting to catch up and check in. Ask first how things are going since you last worked together. Ask client if they’re interested and would love to provide incentives since you loved working with them so much. 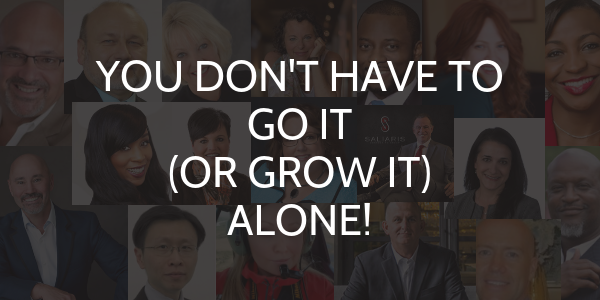 Your earning potential is not defined by the number of leads you are able to generate - it's all connected to what you DO with a lead once you get one. EVEN if you feel the crunch on the finances, you do not want to under-value what you can bring to the table. I am an investment that generates a powerful return!" When you stand in your worth and use techniques to transition a smaller paying request into a larger consulting engagement - you'll not only relieve your immediate financial needs but also set yourself to grow and scale your profits. Second, create a partnership proposal that gives them the roadmap to solving their real issues and options for how to work with you - including an option that should be a no-brainer, easy starting point for the both of you. Third, when you close the deal - NEVER let fear take over the process. Even if you have money issues that you want an immediate solution for, don't compromise your value. You can reduce scope or be flexible with payment terms, but don't lose sight of your worth. The work won't feel good in the short-term and it won't set you up the way you want for the long-term. If you'd like more personalized guidance to enhance your marketing effectiveness and land higher paying contracts, I'd love to help you. My goal is to ensure you are NEVER in the "feast or famine" income situation and that you have stable and scalable profits from your business. But more importantly - you have an amazing track record. Otherwise you wouldn't be a consultant (or thinking seriously about it.) Why settle for being seen as a contractor or "extra pair of hands" when you have the potential to be positioned and perceived as a sought after thought leader? My programs are designed to give you more than a few marketing tips - you'll have a proven system - from idea to launch, through landing clients and delivering results to develop you into a world-class consultant that is a confident and credible peer to high-paying influential senior leaders. 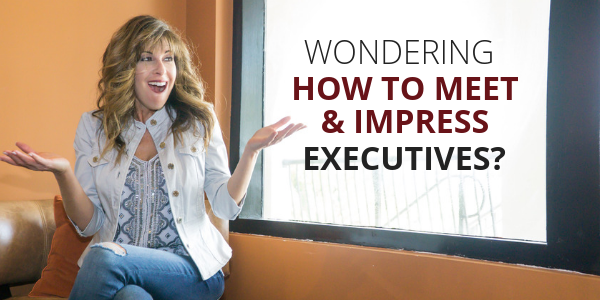 When you have the system, along with the unstoppable, authentic consulting confidence - everything you need to grow your business will feel almost effortless!